As the Thanksgiving season approaches, we find ourselves thinking more and more about the concept of gratitude. This is especially true of Christians, as gratitude is such an important part of our faith. In fact, did you know that the idea of giving thanks is mentioned at least 140+ times (varying by translation)? Sometimes, being grateful comes incredibly easy. It's not hard to be grateful when everything is going as we had planned. When finances are good, when there are no health issues in the family. when there are no major crisis's, when there are no worries--- that's when it's easy. But the Bible doesn't tell us to be thankful in the good moments, but instead tells us to 'give thanks in ALL things'. Well now, that can be a challenge, can't it? Giving thanks for the negatives in your life can be a lot more difficult to put into practice, but it is in those times more than ever that we NEED that attitude of gratitude. So, where do we find that? Today I'm sharing some quick tips on finding gratitude even in the hard times. Look for the Good. Yes, that can sometimes be hard when things aren't going well, but there is ALWAYS some sort or good in life. Are your kids healthy? Do you have a roof over your head? Do you have a good support system? Maybe it's something much smaller, like someone opening a door when you're trying to juggle children and shopping. Look for those moments, focus on them. Words Matter. Think about the way you talk about the goings on in your life. Do you tend to use words like 'dread, awful, horrible' more than words like 'blessed, grateful, hopeful, love'? These words can have a deep impact on your attitude. Don't get me wrong, I think sometimes we need to talk about the bad things and get it out... but when I vent I personally try to watch my words and often even recall the good points, or acknowledge God's plan in all of it. At some point it might be a little more 'fake it til you make it', but in time I've founding keeping my words positive helps keep my attitude that way too. 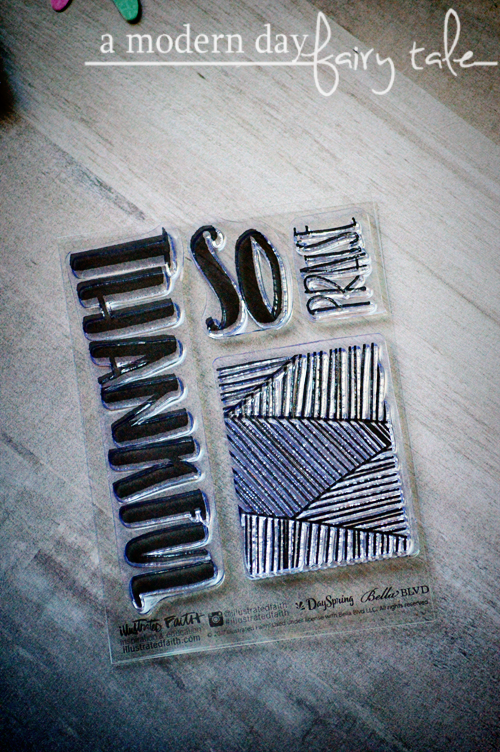 Make Saying 'Thank You' a Habit. One thing I always teach my children even at a very young age is to ALWAYS say 'thank you'. Not only does it help with keeping that gratitude attitude, but it reminds others that they are appreciated too. Whether it's talking to a customer service agent on the phone or grabbing food from a drive thru, I make a point to ALWAYS say thank you. Say It Out Loud. For many going around the table and saying what they are thankful for is a Thanksgiving tradition, but why not make it EVERY DAY. At dinner every night, have each person share one good thing- big or small- that happened that day. Learn from the Past, but Don't Live In It. Often times when I'm finding myself falling into that 'woe is me' attitude, I reflect on previous hard times I've had and how God got us through them. It's hard to see God's plan in the bad as you are in the midst of it, but by looking back on those previous times, I am reminded that He IS here, and that this too WILL pass. Pray Constantly. Prayer is such an important part of our faith and can truly have such a profound impact on our attitudes. When I feel myself starting to let negative feelings creep in, I take a moment and say a little prayer. Don't Compare. For the perfectionist in me, this one can be tough- especially in this social media world where we see only the best of the best. Am I as good of a mom? Am I as good of a blogger? Why can't I have THAT house or those skills? When we spend our days comparing ourselves to others- or even to things we USED to have- it makes it impossible to truly enjoy and be thankful for the things we DO have. Journal It. 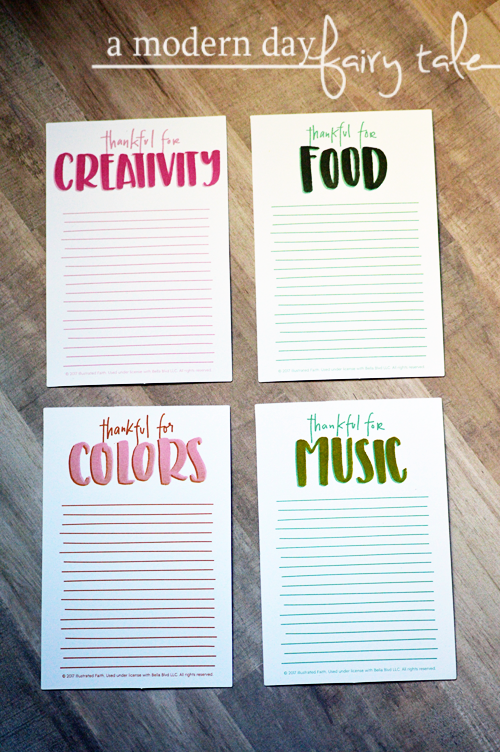 Similar to the idea of saying the things you have to be thankful for out loud, journaling can be a great way to truly have us focus on the good, but the benefit of journaling is that you can look back on everything you're written or the artwork you've created to be reminded again of those moments. This November, I am going to make it my goal to do some gratitude journaling in my journaling Bible. This year has not been an easy one by any means, but I want to document the good and end the year with a positive and hopeful attitude. Need to change your attitude to one of gratitude? I challenge you to join me too. If you've ordered a kit in the past, or have just followed my posts, you might notice that this kit is just a little bit different than the norm. First up, the stunning acorn tip ins are perfectly suited for the fall season. I must admit, I might have squealed just a little when I saw this. 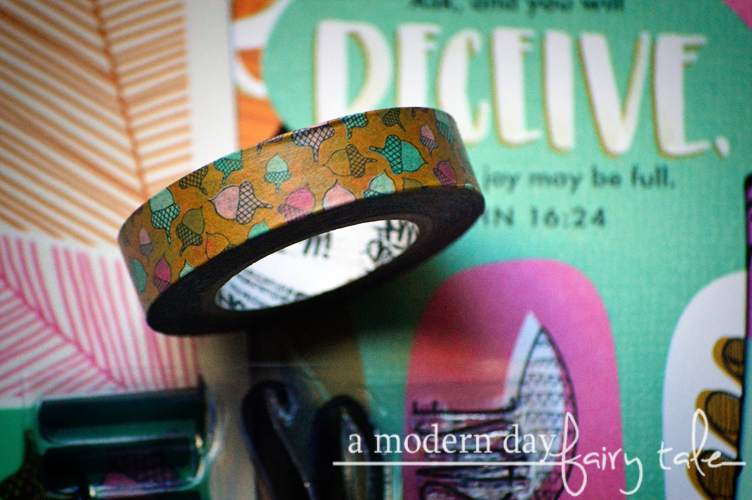 I loved the hearts from kits past, but this is a great way to mix it up...and tie in the acorn washi too! 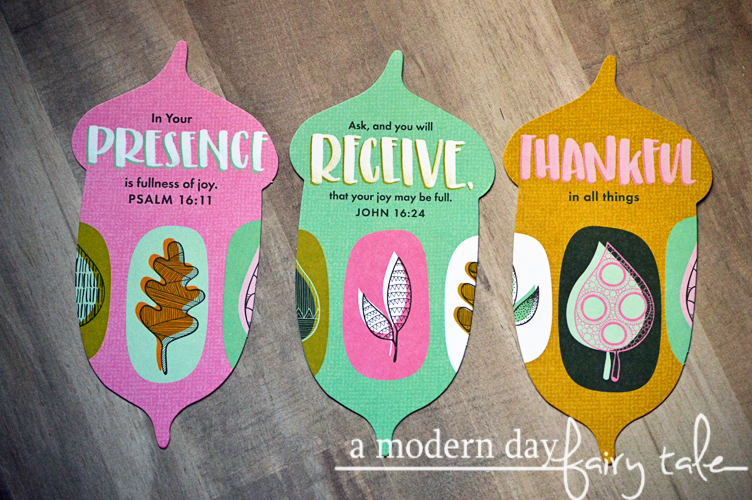 Perhaps the biggest difference though are the devotional/journaling cards. 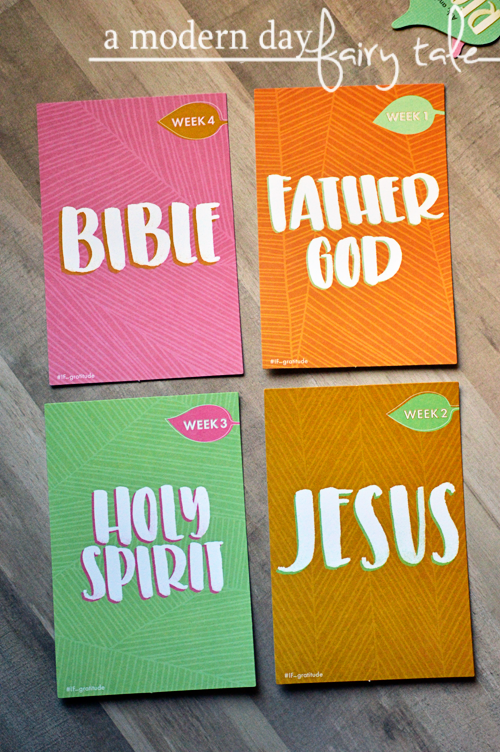 In the pasts, these typically feature 4 devotional cards with a fun print on one side and a short devotion for the week on the other. 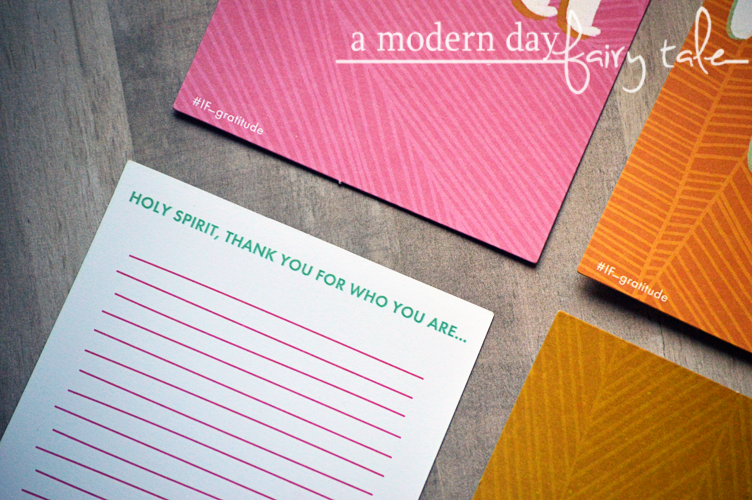 Instead of a typical devotion however, these just feature a print on one side and space to journal your gratitude toward God, Jesus, the Holy Spirit and God's Word. I love this! To be honest, I'm not sure if I ever stop and think to give thanks for the Bible or even the Holy Spirit, so what a great way to reflect on that. 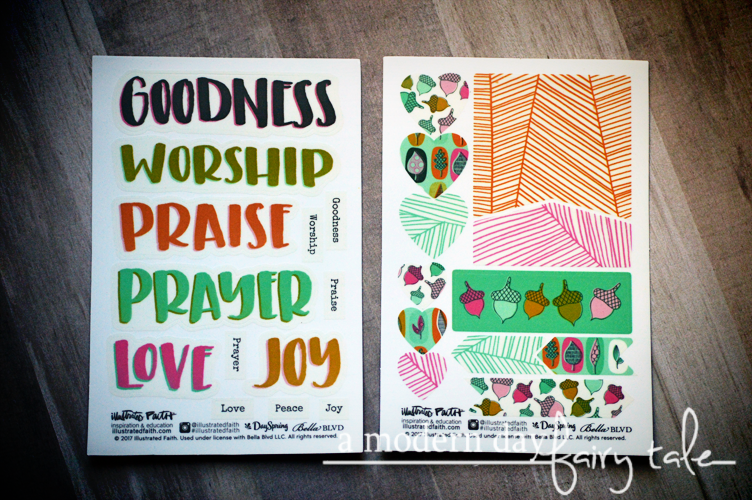 Journaling cards also usually feature a design on one side with journaling space on the other. Instead, these feature double sides journaling spaces with 8 different prompts to reflect on and journal. Aside from the unique format, I really love the style of this too... simple and perfect for fall, but a fun twist on your typical fall colors too. 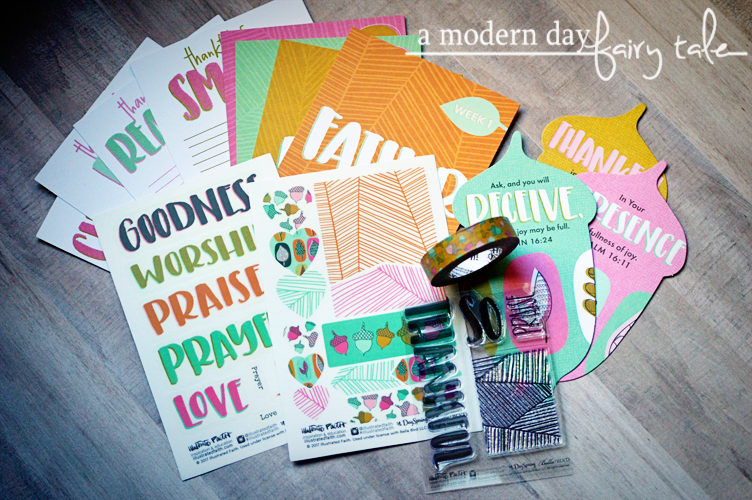 It also seems to coordinate very well with the Gratitude Documented Collection from Illustrated Faith, so you can buy even more great pieces to take your journaling to the next level. 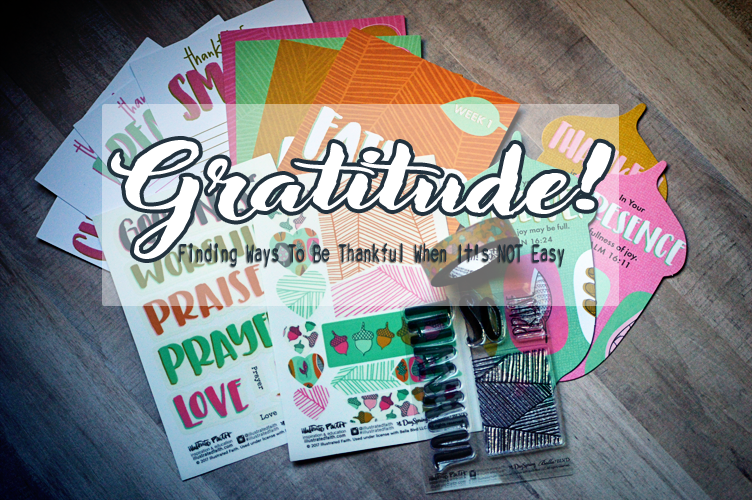 If you'd like to join me through November in documenting YOUR gratitude, head on over to Dayspring to purchase the kit today! I love this!! Its SO important to be thankful for every day but I think we all forget!! It's always good to look back and appreciate that things you have been able to achieved so far. Thanks for sharing! Visit us on our Instagram page https://www.instagram.com/edubirdie/?hl=en. Have a good day!